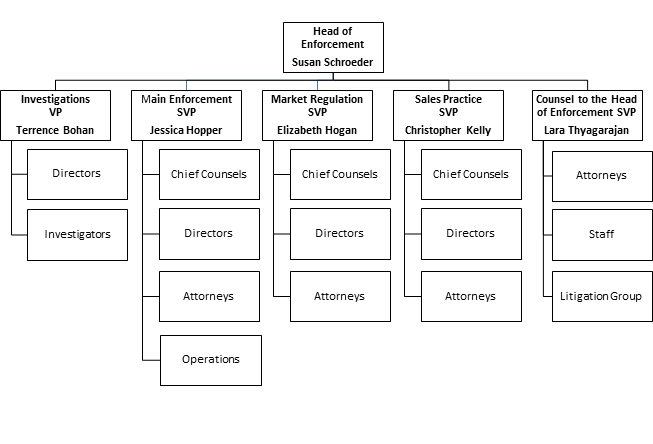 WASHINGTON – FINRA announced today the Department of Enforcement’s new structure and senior leadership team. This marks the completion of the final phase of the integration of FINRA’s enforcement functions—a process that began with the July 2017 promotion of Susan Schroeder to FINRA’s Head of Enforcement to create a unified enforcement function. This consolidation is a key outcome of FINRA360, FINRA’s ongoing comprehensive self-evaluation and improvement initiative. Prior to the consolidation, the department was separated into two distinct enforcement teams within the organization—one handling disciplinary actions related to trading-based matters found through Market Regulation’s surveillance and examination programs, and the other handling cases referred from other regulatory oversight divisions, including Member Regulation, Corporate Financing, the Office of Fraud Detection and Market Intelligence, and Advertising Regulation. The new Enforcement structure is designed to facilitate more consistent decision-making and outcomes by, among other things, supporting new centralized functions. These include a new process for department-wide consultation on matters referred to Enforcement, and a unified team of Enforcement investigators who bring subject-matter expertise to the wide range of cases on the Enforcement docket. Office of the Counsel to the Head of Enforcement – A new unit that centralizes a group of experienced attorneys and staff to consult on matters referred for Enforcement action, which was created to enhance the consistency and transparency of Enforcement investigations and outcomes. This unit is led by Senior Vice President Lara Thyagarajan, who joined FINRA’s Enforcement Department in 2006 after having been a partner in private practice representing broker-dealers in regulatory investigations and administrative hearings. The Chief Litigation Counsel and Litigation Group also report to Thyagarajan. Investigations – A new unit consolidating Enforcement’s non-attorney investigators who have significant industry expertise and investigative experience, and work with Enforcement attorneys and other groups within FINRA that conduct investigations of potential misconduct. Terrence Bohan—who has spent the past 23 years at the SEC’s New York Regional Office, most recently as a manager in its broker-dealer inspection program, and joins FINRA as Vice President of Investigation on August 13—will lead this new unit. Main Enforcement – Generalist attorneys organized in cross-office teams, who investigate and prosecute all types of disciplinary matters. This unit is led by Senior Vice President Jessica Hopper, Deputy Head of Enforcement—a 14-year veteran of FINRA’s Enforcement Department with experience as a manager in compliance in the industry. Sales Practice Enforcement – A specialized group of attorneys that counsels Member Supervision examiners during examinations and investigations, and brings disciplinary actions concerning sales practice violations. Senior Vice President Christopher Kelly—a former Chief of the Economic Crimes Unit for the U.S. Attorney’s office in the District of New Jersey—leads this group. Market Regulation Enforcement – A team of attorneys specializing in counseling Market Regulation examiners and analysts during trading examinations and investigations arising from FINRA’s trading surveillance, and prosecuting resulting disciplinary actions. This group is led by Senior Vice President Elizabeth Hogan, who joined FINRA in May after 12 years in private practice representing firms in regulatory investigations, specializing in matters involving market structure.